Putting Some Roots Down–To Snack On! While spring is just around the corner (fingers crossed) our local farmers’ market is still just sliding by with what’s left of the winter picks. That means there are tons of potatoes and turnips, but not a lot of color. A giant pile of carrots did catch our eye though and we figured they could provide a pretty pop at a dinner we were hosting. We ended up shredding them along with some scallions and transforming them into crispy cakes with a caramelized shallot crème fraîche topping. They were a big hit with our friends and we’ll definitely be making them again. 1. Add the butter and shallots to a large pan over medium. Cook, stirring occasionally, until brown and caramelized, about 15 to 20 minutes. Transfer to a paper towel-lined plate and set aside to cool. 2. Preheat the oven to 350°F. In a large bowl, combine the flour, 1 teaspoon canola oil, eggs and a pinch each salt and pepper; whisk. Mix in the carrots, scallions, garlic and 1 tablespoon parsley and toss until combined. 3. Fill a large heavy-bottom pan with a 1/4-inch of canola oil and heat over medium. Once bubbling, add the carrot mixture, 1/4 cup at a time, and press down to form a cake. Cook for 1 to 3 minutes or until browned, then flip and cook an additional 1 to 3 minutes. Transfer to a rack lined with paper towels and continue until all of the carrot mixture is used, using additional oil as needed. 4. Transfer the fritters to a baking sheet (preferably one lined with racks) and cook in the oven for 10 to 15 minutes or until crisp. Meanwhile, combine the crème fraîche, scallions and remaining parsley; add salt and pepper to taste. Serve alongside the heated fritters. SWWU Tip 1: Make quick work of prepping your ingredients by shredding the carrots, scallions and garlic in a food processor fitted with the grater disk. SWWU Tip: Fritters can be made up to one day ahead and stored in an airtight container in the fridge. Just wait to heat them in the oven until just before you serve them. 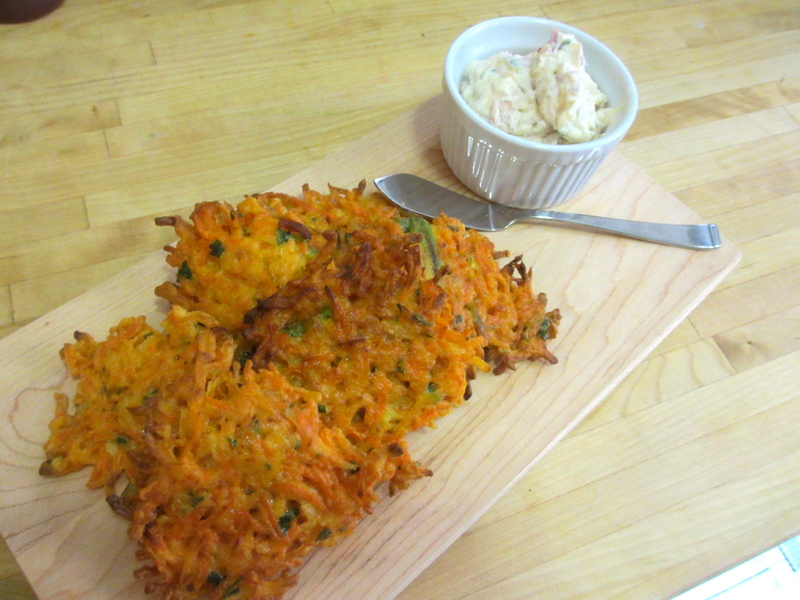 This entry was posted in In the Kitchen and tagged @SWWUblog, appetizer, carrot fritters, crème fraîche, in the kitchen, party food, snack by Something We Whipped Up. Bookmark the permalink.